Nicol’s paper has been around for a while, but doesn’t seem to have been published in any way – it’s still a .doc file. One thing I check when I see it – Eq 14 gives the characteristic absorption distance for CO2, which comes to about 10^-17 m. He describes this as “symbolic only”, but it is indeed the outcome of the calculation, based on his theory. It’s obviously physically absurd. It’s less than a millionth of a molecule diameter, and much less than a billionth of a wavelength. A couple of years ago ago Arthur Smith pointed out the underlying error, which I now forget, but it’s about 11 orders of magnitude. But I notice the paper continues to circulate uncorrected. But you’re right – the more fundamental error is assuming that in the atmosphere, IR absorbed is extinguished. I understand Dr Nicol is an optical spectroscopist, and of course gases absorbing light don’t radiate at those frequencies. But at thermal IR wavelengths they do. I should have commented that I didn’t check all the equations – that would have been too much work. If they were of the right form I didn’t dig deeper. With such a lack of clarity, and a lack of understanding of the basics, it would not be surprising to find many more errors. What I can’t understand is why the many people supporting the paper haven’t checked it. Uncharacteristic. Yes, this paper’s been around a while. I forget what the error was too, but something to do with the way he formulated the Einstein equations for absorption – some factors of the speed of light missing, probably. I think a simple dimensional analysis shows some of his equations have to be wrong. Your blog is a very useful resource. It is like wine, improving with time. Nice post. Yes, ironically it was the one actual casualty of climategate. The traffic drowned the CA hardware. A lot of good material went down with it. SOD summarizes the situation correctly: “Dr. Nicol’s paper doesn’t explain what’s wrong with existing theory and it is almost as if he is unaware of it.” It is the obligation of anyone challenging an existing theory to accurately summarize the existing theory and unambiguously show where it contains a mistake or at which step a new approach is required. Both Nicols and G&T waste huge amounts of space reproducing existing theories, leaving the reader with only the vaguest idea of how they arrive at a different result. This is why peer review is important – it should force scientists like Dr. Nicol to accurately defined the differences between his work and previous work. Any useful new theory must reproduce experimental OLR and DLR as well as current theory, BUT the data from Goody or Dressler doesn’t come close to showing that the conventional view of GW is correct. On the Dressler graph, there are “six radiative forcing for 2XCO2” per 20 W/m2 marker on the theory/vertical scale and four “5 W/m^2 uncertainties” (one sigma?) per 20 W/m^2 marker on the observation/horizontal scale. The agreement between theory and observation doesn’t demonstrate that we can calculate the radiative forcing associated with 2X CO2 with anything like the kind of accuracy claimed by the IPCC (+/-10%). I have yet to see a coherent discussion of how radiative forcing is calculated, usually just a non-specific reference to MODTRAN or HITRAN: What altitude is chosen for the tropopause? How much difference does the chosen altitude make (since radiative forcing is compensated by convection at some altitudes)? How does the upper end of the fixed lapse rate compare with this altitude (since a fixed lapse rate is the mechanism by which changes at the tropopause are transmitted to the surface? Personally, I would prefer to see SOD focus a larger fraction of its attention on the uncertainty inherent in the scientific fundamentals of the current consensus (radiative forcing, feedbacks, and models) and a smaller (but not negligible) fraction of its attention on radical attacks on the basic science. However, this is his blog and I do appreciate everything SOD does, and does far better, than most. There’s a wealth of detail on the atmospheric profiles in the text file that can be viewed by selecting ‘save text output for later retrieval’ at the MODTRAN site and then clicking on the ‘view the whole output file’ link below the atmospheric profile graph. The graph is wrong for the CO2 profile. It should really be a straight vertical line. The water vapor profile is a little off too for the same reason. The tropopause is defined as the altitude where the temperature stops decreasing. It varies a lot for the different locations and season settings. It’s highest in the tropics and lowest in sub-Arctic winter. For the details on how line-by-line radiative transfer calculations, Google Clough line by line calculation and start reading papers. Some may even be free. Or you could buy Petty or Goody and Yung. I think this serves to show that in actual fact, the factors affecting olr (emission) from the top of the atmosphere are not well understood. …” It is the obligation of anyone challenging an existing theory to accurately summarize the existing theory and unambiguously show where it contains a mistake or at which step a new approach is required. “……. Could you point to a version of this “existing theory” which is consistent, internally robust, universally accepted by its adherents and comes complete with a summary? So far I have come across several versions of the so called “greenhouse theory” which one is the orthodox one? There are several books for undergraduate students of atmospheric sciences which cover this topic in detail. I suggest that you read and understand them. It will take you time and dedication. In case you need the references, here are some of them. Hope this list helps. I got curious here. What are those several versions of the existing theory? This isn’t my job. Scientists publishing papers are always expected to put their work in context of the existing literature. It would be trivial for Nicol to insert a few statements that make it clear what he is doing differently. “The derivation up to this point is the conventional explanation for ABC (references cited), but at this point we do XYZ for reasons PQR. The final result is STU instead of DEF. Peer reviewers should require Nicols to put his work into this form before publication. When Nicols puts his work into proper form, we can debate it – even if biased reviewers prevent its publication. In its current form, its a waste of time (IMO). The same problem exists with G&T. The first paper seemed to complain that any downward radiation from the colder atmosphere to the warmer earth (the essence of greenhouse theory) was forbidden by the 2LoT, but G&T never discussed whether it was permitted when offset by more radiation from the earth to the atmosphere. After comments by critics, G&T replied that DLR wasn’t forbidden at all. What a waste of time! Even in their reply, G&T never did make it clear what was forbidden. Your article put forward Dr. Nicol’s article in a very positive light. I point out some its flaws and that the current theory matches measurements very well. You counter that the overall climate is very complex. First, you should comment on your earlier support of Dr. Nicol’s theory. If there is measurement/theoretical uncertainty in the existing theory it doesn’t follow that someone who has written a very flawed paper is correct. Second, uncertainty in the sinks and sources of the global energy budget doesn’t demonstrate that the factors affecting OLR are “not well understood”. Why do the flux and spectrum measurements match the current theory so closely? Why does the Nicol’s paper not address emission from the atmosphere? Why do you think it is a “..mathematical and physical analysis of how energy is transmitted from the surface through the atmosphere..” that is an improvement/overturning of the current theory? Where is the evidence for this? Do any of these books have such a version? A version of this “existing theory” which is consistent, internally robust, universally accepted by its adherents and comes complete with a summary? All those books present the same version, with more or less mathematical detail or more or less detail in different parts (radiation, thermodynamics or dynamics). Unfortunately, I can not avoid that you take the work to wade through the books. You can not learn unless you do that. If you really want to understand the details under the hood, you must be willing to read undergraduate books on the topic. I have not read Professor Nicols paper, I can not tell you about that. From what I have read in this blog, I don’t think I should read it. Perhaps if it appears in a reviewed journal I would do, but it seems to be way far from that status. 1) Nobody discusses that water vapor and clouds play a key role in long-wave radiation transfer. This is not new, it is well known since at least 40 years. It does not invalidate current theory, since it holds this fact. 2) This is not true. If you refer to scattering when you write “re-emission”, this is not new, scattering is well known. If you mean that photons are absorbed and then emitted according to Planck’s emission, the answer is yes, it is well known, too. I don’t understand exactly what you mean here. 3) Nobody disputes this since 1967 (at least). This is standard knowledge in climatology. It is a well known fact. 4) Same as 3 above. The atmospheric equilibrium is radiative-convective, a well-known fact. This does NOT invalidate current standard climatology, since we all know that. 5) This is not true, according to current knowledge. Refereed papers describing measurements and theories do not support this point at all. I insist that you should read books on the topic if you really want to understand it. There is no way to escape from reading. I have read some standard “mainstream” books on climate science and fail to see any point in further duplication of this effort. Have you read any standard Physics books and in particular the thermodynamics sections? Since at the temperature of around 15C most of the CO2 molecules will have their KE in the translational form, I would expect that virtually all CO2 molecules would be capable of absorbing the 15um and 4um IR photons if provided. However for the CO2 molecules to re-emit is statistically less likely. 4 emissions per hundred absorptions for the 15um photon. 4um photon emission probability is 5 per million absorptions. Radiation arising from cloud or water droplet sources could then be added to get the “backradiation” figure. I agree with 1 above in the sense that (H2O)v and clouds are important factors in the transmission of long wave radiation. That’s all. I agree with points 3 and 4 above in the sense that the atmosphere is (approximately) in radiative-convective equilibrium. I do not agree that those points “falsify” the current theories of climatology, since those theories already consider those facts since at least 1967. I disagree with you when you say you prefer not to read undergraduate books. It’s your decision, but it is a wrong decision. The question whether I have myself read books on basic thermodynamics is just pointless in this discussion. I have read quite a few. Regarding 2 above, I think you have a serious problem in your analysis. You seem to refer to the inner state of the molecule (translational bands), in the realm of quantum mechanics and then, you mention the Maxwell-Boltzmann distribution, which does not explain the distribution of the velocities of the atoms in the molecules and, by the way, can not be applied to such a system. See, for instance, Atmospheric Thermodynamics, by Bohren and Albrecht. So, I can’t see the point of your argument above. By the way, you seem to accept that the only molecules acting are the CO2 ones, which is also incorrect in radiative terms. I will leave it here. I think you can have a better theory. I accept that you can have the best theory ever considered up to date. Well, you can just formally specify your hypothesis, derive the consequences of your hypothesis, and show in a convincing and concrete way why does your theory solve some problems that the previous theories didn’t solve. That is the way physics has worked in the past centuries, and that is the way it will continue to work. Just state your hypothesis, show the consequences of them (in a mathematically complete and consistent way) and show that the consequences of accepting your point of view leads to better predictions than the currently accepted theory does. Send to a journal, convince the reviewers and so on, it is hard, but it is the way. I correct myself. When I say “inner state of the molecule (translational bands)” I mean “inner state of the molecule (vibrational bands)”, the band at 15 micrometers you refer to, Bryan. To prove a theory is false you don’t have to supply any alternative theory! a) Show that the theory makes predictions which turn out to be false. b) Show that the theory has internal contradictions. I’m not sure I understand all of your questions. .. I have yet to see a coherent discussion of how radiative forcing is calculated, usually just a non-specific reference to MODTRAN or HITRAN: What altitude is chosen for the tropopause? How much difference does the chosen altitude make (since radiative forcing is compensated by convection at some altitudes)? How does the upper end of the fixed lapse rate compare with this altitude (since a fixed lapse rate is the mechanism by which changes at the tropopause are transmitted to the surface? In the case of the calculations and measurements shown it’s very simple. The calculations are done for the measurement altitude. In the case of the spectral calculations at the ground it is even simpler. Perhaps you are asking about the “doubling CO2” result? Back to your earlier question – “..a coherent discussion of how radiative forcing is calculated, usually just a non-specific reference to MODTRAN or HITRAN..” – most papers that discuss the subject identify the band model or line by line set that is used. MODTRAN is a band model. HITRAN is the database of spectral characteristics by wavelength of each gas. 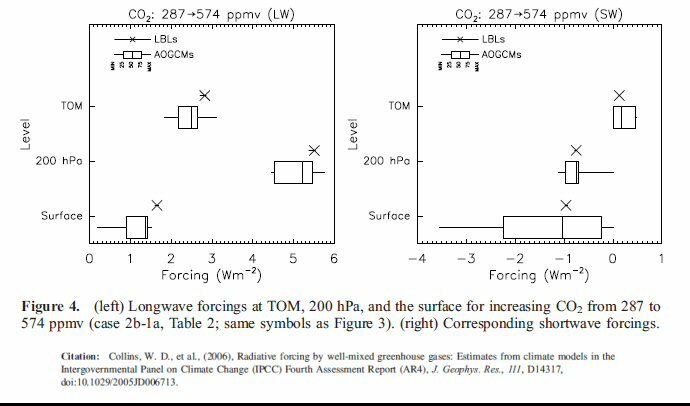 For coherent discussions – for example: New Estimates of Radiative Forcing due to Well-mixed Greenhouse Gases, by Myhre, Highwood, Shine & Stordal, GRL (1998). In this study, radiative forcing is calculated as the difference between irradiances in the pre-industrial and present day atmosphere due to the changes in the WMGCC as described in the IPCC (1995). The full definition of radiative forcing includes stratospheric temperature adjustment. Their paper also details the LBL scheme and band models used in their analysis. I should add that earlier papers discuss the form of the radiative transfer equations and there isn’t any discussion about their form. 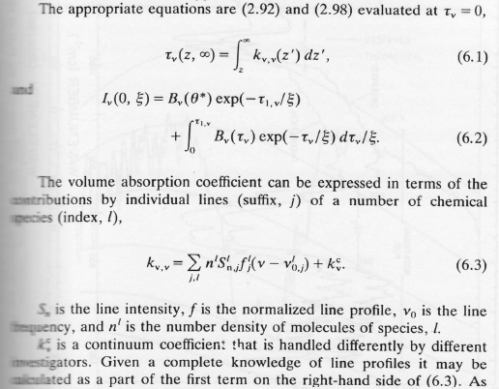 Later papers generally don’t reproduce these formulae. For changes – i.e. doubling CO2 – prior to feedbacks, the assumption is that the lapse rate doesn’t change (that’s the definition of no feedback). Frank asked about the tropopause height for the calculations of OLR and radiative forcing. I have at least one paper discussing this that I have read some time ago, I will review and either comment or write a new article. Somewhat fuzzy, but this is my working model. A GHG molecule does not know or care if it is below or above the tropopause; it will radiate or not dependent on its own energy levels. I can’t remember the sources, but I recall reading that the mean altitude of emission for photons leaving the TOA is about 5 km from one source and about 6 km from another. Either is substantially below the mean height for the tropopause. What I’m getting at is that I don’t believe there is a direct relationship between emissions and tropopause height; though, there will be an indirect relationship. The tropopause height varies with latitude, season, and, I’m pretty sure, night and day. It is governed by a relative energy level, how much energy is there below versus how much energy is there above. Emissions are more of a flat, how much energy is there. uncertainty in the sinks and sources of the global energy budget doesn’t demonstrate that the factors affecting OLR are “not well understood”. The absorbance spectrum is pretty uncontroversial, and your graph form Goody is fine. The Emission is a different kettle of fish, why didn’t you show a graph of that, comparing theoretical to measured? Because early on he claims to prove most radiative emission energy is rapidly absorbed low in the atmosphere and then dissipated in collisions. According to his analysis, the radiative component thus becomes negligible compared to other forms of energy transfer up the atmospheric column. I’d like to have a stab at tallbloke’s second question. We already know that convective transfer dominates radiative transfer within the troposphere. That’s pretty much why there is convection within the troposphere and not above it. However, if the emission from the atmosphere is negligible, and most of the radiative energy from the ground is absorbed by the atmosphere, how does the energy from the sun leave the earth system, atmosphere included? It’s almost as though Nichol’s model has the tropospheric convection reach to the top of the atmosphere, and there, all at once, and not before, the gases release their photons. Also, just because energy is dissipated does not mean that in ceases to exist. If a CO2 molecule can loose energy through collisions, then it can gain energy through collisions as well. It’s not an either or situation. As Nicol correctly points out, convection dominates in the troposphere, because the gases are denser and mean free paths are short. Once up at the tropopause, where the air is thinner, and the atmospere is already much cooler, due to precipitation etc, the radiation from molecules is much more likely to have a clear path to space. OK, so, rates of absorption are largely dependent on the density of the absorber. Increasing the PPM of a GHG at a constant total atmospheric density means that the partial density of the GHG increases. Which means that, for whatever value of likelihood of a photon escaping to space that you choose, the altitude at which that occurs will be a little higher with a higher PPM than with a lower. As I’ve said before, and Leonard Weinstein has said better, from there you can calculate a warming at the surface based on the lapse rate. Sometimes I come across people who think that the tropopause is at some fixed level. It is not, it’s just wherever the forces driving convection wind down. Also, pressure (PV=nRT) isn’t affected by where the tropopause happens to be. Density is to some extent because of the change in temperature curve, but regardless, it is not the case that there is a sudden drop in density only at the tropopause. Pressure declines on an inverse exponential from the ground up; density follows smoothly within the troposphere. 1) Your article put forward Dr. Nicol’s article in a very positive light. 2) I point out some its flaws and that the current theory matches measurements very well. 3) You counter that the overall climate is very complex. 4) First, you should comment on your earlier support of Dr. Nicol’s theory. 2) On absorption, not emission, the main thrust of Nicol’s piece. 3) No, Kevin Trenberth says climate is very complex, which it will ineveitably appear to be when you try to stuff it into a pre-concieved box driven by a trace gas. My own model shows climate is actually pretty simple. 4) The entire extent of my intro to Nicol’s piece is given at 1). What is there to comment on? 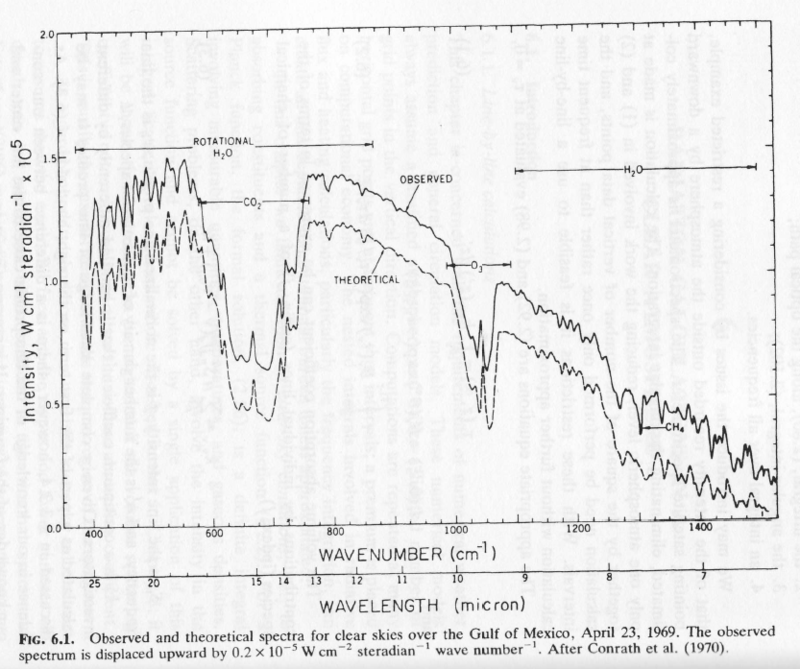 The graph from Goody is the measured spectrum of radiation by satellite. The green term is the surface radiation that makes it to top of atmosphere. The blue term is the atmospheric radiation at each height that makes it to the top of atmosphere. As soon as you have to start considering absorption and emission relative to density and composition, it becomes clear that the mean altitude of emission becomes higher with an increase in GHGs. Same temperature at a higher altitude, within the troposphere, and you can follow the lapse rate down to a higher temperature at the surface. What analysis? I can’t even work out exactly what he’s claiming. Emissivity = absorptivity at a given wavelength for a gas. If it absorbs then it emits. Perhaps he has a new form of the source function for emission but just assumed everyone knows it. Convection dominates energy transfer in the lower troposphere (otherwise the surface would be much hotter) but that doesn’t mean the atmosphere stops radiating. Then presumably this means any photon absorbed leads to a similar one being emitted. How on Earth do you then say that this heats the atmosphere? There seems to be a massive contradiction in your analysis! Bryan: Emissivity is not equal to emission. See my reply to Chris G below. 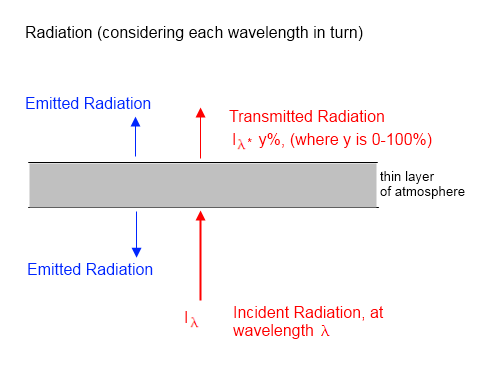 Take a look at the drawing with the heading “Radiation (considering each wavelength in turn)”. See if you can work it out. I believe I can identify one of the fatal errors in the Nicol paper. Did he just say that CO2, or any gas for that matter, can emit frequencies that it can not absorb? If Nicol gets that wrong, …nevermind. BTW, no Bryan, emissivity = absorptivity does not lead to your presumption. Was Nicol here referring to the atmospheric window if not please give page reference. ….”Some of these frequencies will lie outside the absorption bands of any atmospheric molecules”…..
Hopefully there are very few followers of this nonsense. The temperature of a gas is proportional to the average translational KE of its molecules. If the atmosphere is to be heated by radiation then the first prerequisite is that the radiant energy is thermalised. Then comes a secondary question what is the likelihood of emission from possibly a much lower temperature. Sure, but time series graphs of the actual emission of OLR from the TOA don’t bear much relation to the greenhouse theory, because there is much else going on besides, which we know little about. Rates of LW emission from the oceans for example. This is the real reason you won’t show graphs of OLR. Because it would neatly demonstrate that the atmospheric gas makeup is only a small part of the overall climate picture. The ONLY way for a gas to be heated is for the the translational KE of its molecules to INCREASE. Absorbing and re-emitting a similar photon does absolutely nothing for the translational KE of the air molecules. “Climate Science” would like to think of itself as a real science but if this represents orthodox theory, its just pathetic drivil. “The real reason you won’t show graphs of OLR..“? You promoted a theory that is flawed and has no experimental backing. I explained the standard theory that has been around for almost 50 years and that has extensive experimental support and your point is, what exactly? I didn’t show a totally new graph? A different graph? A graph of OLR against time? It’s clear from your many comments that you don’t really understand radiative transfer theory and instead of admitting it you appear to claim that I am trying to hide stuff. If your point was that climate science can’t “_______” (fill in the blanks) then please articulate it. Then I can address that point. If you claim that Dr. Nicols has “..closely argued, mathematical and physical analysis of how energy is transmitted from the surface through the atmosphere, answers all questions..” but he hasn’t, don’t be surprised that you are picked up on it. If you want to defend Dr. Nicol, go ahead. If you want to claim that Dr. Nicol has been misunderstood, go ahead. If you don’t want to defend Dr. Nicol because you don’t know whether he is right or wrong, why not state that? If you want to move on, because you don’t really understand what his flaws are, just have the grace to say it. Then we can address your new points. Right now, I’m still addressing your original point and actually not trying to hide anything. I think you already said that on November 2, 2010 at 11:29 pm. I see that you don’t understand a very simple point. You perform a valuable service for this blog in demonstrating how weak the arguments are for the “no greenhouse here” brigade. If anyone else thinks Bryan’s question needs answering, please ask and I will attempt to answer it. Please show where I have claimed anything about Mr Nicol’s work. If anyone reads your blog it looks like you endorse it. I write an article pointing out its flaws and your various comments appear to support it. If you don’t support it that’s great. Just say. In fact, why are you asking me to prove what you think instead of just explaining your point of view? Step out into the light and state your point of view on Dr. Nicol and his work. I suggest that if you want to get your teeth into those who claim the greenhouse effect is saturated, you tackle Miskolczi’s latest published paper, rather than picking on “some random person”. I already responded to your earlier points (and you didn’t reply). 3)STOP PUTTING WORDS INTO MY MOUTH Kevin Trenberth says climate is very complex, which it will ineveitably appear to be when you try to stuff it into a pre-concieved box driven by a trace gas. My own model shows climate is actually pretty simple. Miskolczi’s paper is a totally different point of view from Dr. Nicol. As I have already explained, I have “got my teeth” into your article because Dr. Nicol has written a flawed paper. Miskolczi’s paper supports the radiative transfer equations. Many papers that contradict each other don’t add up to a new theory. They just add up to a maximum of one paper and possibly zero papers against the standard position. In the meantime your many comments are adding up to strong support for Dr. Nicol, and yet you are asking me to prove that you support these points of view – as if you don’t! When you explain your position, rather than being “against stuff”, I can address it. Who knows, perhaps I will be in agreement with you. Without knowing what you think, it is a difficult task. I can only work on what you appear to support. Right now it appears to be “any theory rather than the ‘greenhouse theory'”. Don’t say “where did I say that”. Say “this is what I think _________” (fill in the blanks). “It is probably impossible to say, without a very detailed analysis to determine each of the oscillator strengths of the transitions involved, whether this process of radiation from upper level transitions or the process of convection followed by radiation at higher, more transparent, levels of the atmosphere, is the dominant path for cooling of the globe. However, it is quite clear, that the radiation from the solar heated surface of the earth, trapped by the GHGs and taken upwards by convection, will not be directly responsible for the return of similar frequencies of radiation to the earth and hence for Global Warming. Thus, it seems possible that the absorption spectrum measured at the TOA will still match earlier theory and experimental result, however Nicol provides substantial argumentation for the view that the energy is transported up most of the atmospheric column by convection, not radiation. Your criticicsm does not address this. “the diagram, Figure 6 shows that the effect of increasing the density of carbon dioxide in the atmosphere, is simply to change the height distribution, and then only slightly, of its thermal heating. In each case, the proportion of energy contained as excitation of a Greenhouse gas, compared to that released through collisions to heat the surrounding gases, will remain essentially the same unless the density of the radiation were sufficient to saturate the corresponding resonant transitions. This is demonstrably not the case, since the rapid transfer of molecular excitation energy to thermal kinetic energy takes place in much less than a microsecond. The CO2 molecules in only 10 m3 on the other hand, if half were simultaneously excited, would be holding 660 Joules of energy, an amount which could only be radiated by the earth in about 2 seconds. So it is a ‘saturation’ argument, though not the same as Miskolczi’s. To summarize, it is not clear to me that your criticism of Nicol addresses the substance of his arguments. You have not demonstrated that his formulation necessarily leads to a substantially different absorption spectrum at the TOA. Nicol had it partially correct. Once a sufficient amount of atmospheric absorbing gases (called atmospheric greenhouse gases by convention) are present, they reduce the radiation transmission to space enough so that convection becomes the dominant mode to transport energy from the surface (and from absorbed incoming energy) back to a high altitude where it is radiated to space. The only way the energy can be radiated to space from the high altitude is by radiating gases, ie. by absorbing and radiating gases. Once this situation is encountered, adding more absorbing gases (but not enough to significantly increase the total mass of the atmosphere) does not change the fact that convection is still the dominant heat transport mechanism. I think this is what Nicol was trying to point out. However, adding the absorbing gas does raise the altitude of outgoing radiation somewhat. It is this increase in altitude of the outgoing radiation that results in the slight temperature increase. Once the dominant mode of heat transport is convection, the atmosphere will form and maintain (on the average) an adiabatic lapse rate. This lapse rate is a temperature gradient due to the cooling effect of rising gas in a dropping pressure (due to gravity). The outgoing radiation has to equal the incoming absorbed radiation unless the temperature is changing, but I consider the case where the temperature has leveled off. In that case, the match of radiations at a particular “effective” altitude (it is more complex due to being spread out, but the same in principal) determines the temperature of the gas at that altitude. This temperature-set only by the amount of absorbed incoming radiation, is then added to the lapse rate time altitude, and this gives the ground effective temperature. You can think of this effect as a radiation insulating, but convective open atmosphere. If the radiation is absorbed by the gas immediately above it, the absorbed energy is transmitted to the surrounding gas by collisions, but likewise the surrounding gas also transmits energy to the absorbing gas, and the local absorptions and emissions will nearly balance. That is the source of “back radiation”. The back radiation is not a source of heating, the fact of moving the radiation to high altitude and the lapse rate do that. I have a strong suspicion this theoretical altitude gain will be a tiny quantity compared to other natural processes affecting the height things happen at in the atmosphere. OK, just for fun. Grinding out the value through integration and/or modeling, using standard formulas as SoD does above, for how much a temperature increase to expect as a direct result of doubling CO2 results in about a 1 or 1.2 K increase. Does that seem too large a value to you? In comparison to the total height of the atmosphere, that does seem pretty tiny to me. Yet, that is all the difference you need in order to fall into the mainstream of what climate scientists are telling us. Do you have a better estimate that you can show work on? What mainstream scientists tell us about basic physics is one thing. What they tell us about how great their GCM’s are is another. So if the level that the upper atmosphere radiates from rises by 1% according to the theory, fine, I can accept that. Can they please bear in mind that the Sun’s activity just caused the ionosphere to shrink by 33%? Natural variations like those can make attribution a teensy bit difficult wouldn’t you agree? With the fluxes and effects aggregated over time, no, I would not agree. This is like your calling up the Trenberth quote; it has the underlying premise that because there are lots of little squiggles on a graph, we can’t detect the larger trend or make attributions about what is causing it. That’s not true. Thinking about how much change in expected escape-to-space altitude is required to fit into predicted direct effect theory, I’d change a few things. If the mean altitude is 5-6km, that’s well within the troposphere, and it’d be better to use the environmental lapse rate (standard atmosphere) rather than the DALR. That puts the increase in the neighborhood of 150m. I wonder if I can get something like MODTRAN to agree or disagree with this as a ballpark figure. I do not disagree with you tallbloke. Remember I am a CAGW skeptic, and I do think increasing clouds or possibly other processes cause negative feedback and result in much less temperature gain than ideal CO2 alone calculated increases. My guess (and it is just a guess) is a gain of about 0.5 C per CO2 doubling. I think we are about half way there from CO2 increases from 1850, and will add about 0.3 C more over natural levels (and who known what those will be) by 2100. “It is probably impossible to say, without a very detailed analysis to determine each of the oscillator strengths of the transitions involved, whether this process of radiation from upper level transitions or the process of convection followed by radiation at higher, more transparent, levels of the atmosphere, is the dominant path for cooling of the globe. The detailed analysis of each vibrational/rotational transition of the various greenhouse gases has already been done. It’s in the HITRAN database. Many of these transitions can be calculated ab initio and the calculated data agrees with the measured data. One then plugs that data as well as a vertical atmospheric profile of temperature, humidity and pressure and it’s possible to calculate the radiative transfer for sunlight in and thermal IR out. Once the radiative transfer is known, the contribution from convection can be calculated by difference. Clouds complicate the calculation but can be added as well. On the subject of humidity, I’d be interested to hear anyone’s thoughts on why it is that at the height of the tropopause, specific humidity apparently correlates rather well with solar activity levels. One of the (many) things which makes me sceptical of the mainstream co2 driven climate theory is that it seems to take little notice of the relative scale of effects. There are big processes going on up in the atmosphere and down in the ocean which dwarf the effect of co2 increases. And the effects of these natural processes are variable, over multidecadal timeframes. Now let’s say that you have observed someone drill a small hole in one side of one die. You make the prediction that will make the number on that face come up just a little more often, because that side is a little lighter than it used to be. Let’s say it was the 1. You observe the dice being rolled 1000 more times, and now the mean is, let’s say, 6.7. We have a cause based on elementary laws of physics, a predicted effect, and observations that statistically are extremely unlikely to have happened just by chance. If you think that climate researchers aren’t aware of the variability induced by factors other than CO2, you haven’t been paying much attention. Not surprisingly, the data are in good agreement with theory. You cannot ignore radiation and say it’s all convection. There are large fluxes up and down. The net convective flux is only a relatively small fraction of the gross fluxes. If the gross fluxes weren’t what they are, the temperature wouldn’t be what it is. This is very interesting. People seem to think that the lapse rate is “given” without questioning why is it the way it is. Unless you accept there are some gross energy fluxes from the top to the surface which are able to explain the turbulent convective fluxes from the surface to the tropopause … how can you explain the existence of the vertical temperature profile? You can’t. Still, in this case and in the Venusian “mistery” some time ago, people tend to think that the lapse rate is constant “per se” (and it isn’t, it is a consequence and not a cause). There are some conditions that have to be met for the adiabatic lapse rate to form and be maintained. The main players are convective mixing ,the net radiation transport through the atmosphere, and presence of condensable gas components such as water vapor. If the convective mixing due to atmospheric temperature variations (due to day & night variations of ground and atmosphere heating, latitude variations, planet rotation, etc.) are large compared to the net radiation flux, the atmosphere will always develop a lapse rate that for Venus is the dry adiabatic lapse rate, and for Earth a wet adiabatic lapse rate.The cause of the adiabatic lapse rates in a well mixed atmosphere are simply due to the fact that pressure decreases with increasing altitude due to gravity. Wiki has a good description of the process. When the adiabatic lapse rate forms,there will be a temperature profile with dropping temperature with altitude.These are all average values, and local variations can occur, but do not change the basic effect. Combining the temperature at a given altitude (which comes from the optical properties of the atmosphere and absorbed solar energy level) with the adiabatic lapse rate results in average ground temperature. Leonard. I know that. The fact is that the argument “temperature of the tropopause increases and then, this means surface temperature must also increase due to the lapse rate” is the argument I don’t agree with stated that way. Perhaps I didn’t explain clearly in my previous message. The temperature profile (in equilibrium) will be the result of the vertical divergence of net (upwards-downwards). Surface temperature can be higher if and only if there are net energy fluxes which explain this increase. This can be radiation/convection and or sensible heat fluxes. But there must exist a net energy flux explaining this increase. So … the lapse rate can not explain anything if we don’t consider energy fluxes. In particular … high-level heating can not be transmitted to low levels through convection alone. Convection will be triggered only if radiation (shortwave or longwave) heats low levels. That is what I meant. The net radiative flux is only a small fraction of the gross fluxes too. Anastasia Makiareva has recently shown that wind velocity is largely a function of mass loss from the atmosphere due to precipitation. Where is that accounted for in the models? Wind on Venus (at high altitudes) is much faster than on Earth. There is no significant precipitation there. Therefore she is wrong on that point. On Earth (and Venus), day to night sunlight variation, latitude variation of sunlight and planetary rotation cause the basic wind patterns. Anastasia Makiareva’s claim may be partially correct for local high wind variation, but not the basic patterns. Also, the mass loss from the atmosphere during condensation is small compared to the effect from heat given off during condensation, which would heat the surrounding air and cause much more expansion than the volume loss due to condensation. It is not the mass loss but temperature increase effect (but it is due to the water vapor condensation). I always take a while to digest them, but it’s usually very instructive. I’m not so sure about Makiereva’s thesis. If you read the comments at tAV, some well informed people disagree rather strongly. IMO, she hasn’t proved her point. Not according to her calculations, which give around 5-10% to heat effects and the rest to the mass loss. On TaV thread de Witt mentions, Gavin Schmidt conceded it was a much more powerful effect than he first assumed. Chris G, I have been paying plenty of attention, and the playing down of natural variability in the system has been a feature of what I’ve seen coming from the proponents of the AGW thesis. One example is your ignoring the point about the recently discovered (and not included in the models) shrinking of the ionosphere I mentioned. What effect does that have on the height the atmosphere radiates at? Does anyone know how deep that drill hole in the dice is yet? The correlation I graphed between solar activity and specific humidity shows there is much more to the sun’s influence on climate than raw TSI figures, which have been varying more than theory predicted anyway. Here are some numbers comparing dry adiabatic expansion and moist adiabatic expansion. We’ll take 1 kg of dry air in both cases from 100,000 Pa and 300 K to 20,000 Pa. The moist air is saturated with water vapor. Water vapor volume for the moist parcel goes from 0.0317 m3 at 100,000 Pa to 0.0029 m3 at 20,000 Pa. The loss of water vapor volume only becomes significant if you could transport the 1 kg parcel instantaneously from 100,000 to 20,000 Pa. But even then, the net result will be an expansion, not a contraction in volume because the temperature would go up by 46.4 K. The water vapor volume at 20,000 Pa if it didn’t condense would be 0.100 m3. So that volume would be lost, but the final volume is 0.68 m3 larger including the drop in water vapor volume. So the rest of the gas expands by 0.78 m3. So you get a ~3% drop in volume. That might be significant if it weren’t included in the models. But as near as I can tell, it is included. SOD, Leonard, Nick, et al: Leonard wrote: “It is this increase in altitude of the outgoing radiation that results in the slight temperature increase.” I’m interested in the details of how radiative forcing is calculated because at some altitudes, there is little or no temperature rise with altitude. Radiative forcing is defined at the tropopause, but some researchers say the tropopause occurs where the lapse rate increases to -2 degK/km (for example, Santer’s Science paper showing that the tropopause has risen), some may say that the tropopause is at 0 degK/km, and Chris G used -9.8 degK/km in connection with calculating the height rise due to radiative forcing. Intuitively, these details seem to be important in translating the expected temperature high in the atmosphere to a temperature rise at the surface. I suspect SOD may say that temperature rise in both locations is the same “before feedbacks”, which I can accept in regions where the lapse rate is relatively constant and where we have a good ideas of how the lapse rate will change (lapse rate feedback). Things could be different in regions where the lapse rate is changing rapidly with height or near zero and significantly effected by changes in the stratosphere. (Santer’s paper says 60% of the recent rise in the tropopause is due to ozone, Pielke reply implies 100%.) Climate models aren’t used to determine feedbacks specific to regions where the lapse rate is changing and my intuition also suggests that models could perform relatively poorly at these altitudes where vertical convection is present but weak. SOD: As you suggested, I did read Myhre 1998 http://folk.uio.no/gunnarmy/paper/myhre_grl98.pdf, but only the abstract of Myhre 1997 which admits that the altitude used to calculate radiative forcing produces 10% changes in the results, but the altitude used in the definitive 1998 paper isn’t clear. http://www.agu.org/pubs/crossref/1997/97JD00148.shtml The 1998 paper uses three “atmospheric profiles” and calculates clear-sky and “global” (including clouds), so there seem to be additional assumptions here. It seems that the IPCC’s claim that we know about changes in radiative forcing within +/-10% is not likely to stand up to close scrutiny, but modestly larger uncertainty wouldn’t be a big deal. Hopefully this will give you an idea of some issues that might be addressed in a post on radiative forcing. The tropopause is picked as the altitude for calculating forcing because the stratosphere and above equilibrate to a change in forcing on a time scale of months because the heat capacity is low and radiation is fast. The atmosphere and planetary surface and oceans take much longer. So to calculate the forcing a change is made in the conditions and the stratosphere and above is allowed to equilibrate and then the forcing at the tropopause is calculated. The height of the tropopause is usually defined as the break point where the slope in the temperature vs altitude profile changes rapidly rather than some fixed slope number. The average height of emission is a construct like average optical depth that throws away a lot of information. The height of emission and optical depth vary strongly with wavelength. In the window region, the emission comes mainly from the surface or very near the surface. In the CO2 band, the emission comes from near the tropopause. 9.8 K/km is a little high for the lapse rate at the average height of emission. A better number is the lapse rate for the US standard atmosphere, 6.5 K/km. That gives a 185 m change for a change of 1.2 K.
My point was that a variety of lapse rates (including zero) could be used in this calculation without a careful analysis. Since the air is very dry near the tropopause, -9.8 degK/km doesn’t have to be wrong. Just a comment that on another blog someone said that my article was very unconvincing “because convection was the dominant form of heat transfer in the lower atmosphere“. It’s a strange comment but no doubt one that resonates with many people. I may write more about this mistaken idea at some later stage, but in the meantime.. If a surface of high emissivity (e.g. water) is at temperature 20’C it will radiate at 415 W/m^2. Now if convection was moving 0 W/m^2, the surface would still radiate at 415 W/m^2. If convection was moving 400 W/m^2, the surface would still radiate at 415 W/m^2. The amount of convection obviously changes the dynamics of the system. But the fact of convection at any one instant DOES NOT affect the amount of radiation emitted. Therefore, the equation of radiative transfer, which relies on surface temperature and atmospheric temperature, still stands, regardless of how much convection (and conduction) is taking place. If you want to know the upwards (TOA) radiation or downwards surface radiation right now, you just need to know the actual temperature. If you want to know the upwards (TOA) radiation or downwards surface radiation tomorrow, you need to have a model that can predict temperatures tomorrow (and water vapor concentrations). This obviously relies on knowing the convective heat transfers taking place (plus many other values). Many people believe that radiation is somehow not that important because convection is so important in the lower atmosphere. That is the subject for another day. But hopefully it is clear that calculating radiation values is a maths problem. And weighing up the relative important of different heat transfer mechanisms is a totally different question. “Now if convection was moving 0 W/m^2, the surface would still radiate at 415 W/m^2. DeWitt Payne’s answer is a good one. Greenhouse gas radiative forcing: Effects of averaging and inhomogeneties in trace gas distribution Freckleton et al, QJR Meterol.Soc (1998) is a good paper for the question about how the definition of the tropopause affects “radiative forcing”. For some background, take a look at On aspects of the concept of radiative forcing, by Forster, Freckleton & Shine, Climate Dynamics (1997). Free here. This is a paper I have only just started reading. Back to the question about the effect of tropopause definition on radiative forcing, clearly it makes some difference. What isn’t clear is whether this definition actually impacts on GCMs, or is just a “headline number” for comparison of different forcings. I have certainly assumed it was a headline number for comparison, and can’t currently claim certainty about that. Something to dig into further. Just wondering if the Daily Surface Radiation budget has ever been reviewed – one that corresponds to the actual surface temperature budget – for example, the average surface radiation budget only varies from 364 W/m2 in the morning to 418 W/m2 at the peak temperature around 3:00 pm. That means that Surface OLR matches Solar SW coming in almost one-for-one throughout the day. There is just a very small imbalance throughout the day. After the Sun sets, OLR continues at 3.6 Watts/m2/hour. Here is the Earth average daily surface radiation budget over 24 hours. One should find that it is unexpected and it should put the back-radiation idea to bed since OLR has to exceed back-radiation throughout the 24 hour period. All the greenhouse formulae need to have a “time element” added to them so it more accurately reflects the real-world climate. For example, the OLR is more accurately reflected as W/m2/hour or W/m2/second . After sunset, Surface OLR is 3.6 W/m2/hour or 0.001 W/m2/second. 1. What does sunny, and/ or warm winter days have to do with green house gases? There shouldn’t be enough irradiance from the sun for any green house gases to trap, during the winter months. Weather reporters in Houston are saying 61 degrees is normal. I grow up in Houston the normal temperature in Houston in winter averages in the 40’s, to low 50’s, and it was never sunny, and warm. There is a conspiracy to deceive the public by the US government, and the oil companies. 2. Why on a hot day is the sun irradiance higher, than the ambient temperature? The green house gas effect is suppose to causes the ambient temperature (the air around us) to be higher, than the sun irradiance, but if you stand under a shade tree the ambient temperature drops, move from under the shade tree into the sun’s irradiance the temperature rises. In an actual green house, or an automobile with the windows up the ambient temperature is higher, than the sun’s irradiance shining into the green house. This proves green house gases are not the cause for global warming. 3. Why in the early 20th century, during the industrial revolution in America, and Europe, wasn’t there a recorded dramatic spike in temperature? The north east region of America was referred to as the rust belt. This region was heavily industrialized, and heavily saturated with Co2, and methane gases. There were high numbers of respiratory cases, and stick smog, but there was no dramatic spike in temperature in America, or Europe. In the early 20th century scientists believed the earth was headed toward another ice age, due to the harsh winter weather, and below normal temperatures in summer. Global warming wasn’t an issue, until the latter part of the 20th century, in spite of all the air pollution in the early 20th century. Global warming should have been an issue in the early 20th century in the rust belt region, if green house gases are responsible for global warming. The industrial activity in the rust belt has ended, green house gases has been dramatically reduced, but the temperature in this area is still increasing, why?. 4. Television, radio, or news paper weather reports never mention the temperature of the sun’s radiance? Generally the temperature of the sun’s radiance is higher, than the ambient temperature, and the temperature of the ocean. Meteorologists, and green house gas theorist blame high pressure, el-nino, the air flow off the Gulf of Mexico for hot weather, these are all, just peripheral conditions. They blame hot weather on everything, but the main cause, and that’s the increasing temperature of sun’s irradiance. Notice they don’t even try to differentiate between temperature of the sun’s irradiance, and the ambient temperature. They are also lying about the average/ normal temperature for winter. The average/ normal temperature for this region in winter is 40 to 50 degrees fahrenheit, they are saying 60 degrees fahrenheit. It’s the sun’s irradiance that heats the oceans, heat the surface of this planet, raises the ambient temperature, and it will the sun’s irradiance that will be responsible for ending all life on this planet. They still treat the sun, and its irradiance as if it doesn’t exist, and the sun irradiance plays a major roll in our weather. 5. The E.P.A was established in December 2, 1970 to address the worsening air pollution, and the high number of respiratory cases, due to the illegal dumping of harmful chemicals in the air, underground, and in water ways. These harmful chemical were released by chemical companies, refineries, smelting plants, and steel mills. The E.P.A wasn’t established to address global warming. Global warming wasn’t an issue, until the mid 1990’s, in spite of all the air pollution, before the 1970’s, why? 7. Why are the most polluted cities, and countries of the world don’t have the highest temperature in summer. Places such as China, and Los Angelas, California, and Houston, Texas, and several countries in Europe generates the most green house gases in the world. The areas of the planet with the highest temperatures are the lease industrialized, such as the deserts of northern Africa, and the Southwest region of United States. Arizona, New Mexico, and the state of Nevada have the highest temperatures in summer, why? As the green house gas theorists answer these questions, you will notice they will add explanations other, than a hole in the ozone, Co2 gases, methane gases, or the green house gas effect for the causes of global warming. They will use highly technical terms to confuse you, but if you investigate their claims you will find it makes no sense, and they never mention the temperature of the sun’s irradiance. It’s the sun’s irradiance that’s responsible for global warming. Move closer to the sun, it gets hotter, move away from the sun it will get colder, and it’s that simple. Many opponents tell me my research is not up to date. Fortunately for me, truth has no statues of limitations. I also been told it’s not the sun’s irradiance that’s causing global warming, because the light from the sun has not intensified. That may, or may not be true, but I know the irradiance of the sun is intensifying. In about 800 to 1000 years from now 2010, the people of this planet will beginning to face extinction. I’m fight for people who haven’t been born, yet, and that includes your offspring. I’m their representative, because they can’t act, or speak for themselves. If global warming isn’t reversed in time,they will have to face apocalyptic events. ..And if you have a wide-ranging essay on why it’s all over for planet earth, or why it’s not all over for planet earth, save it for elsewhere.. However, I will let this “wide-ranging essay” stand as a great example of poetry and not science. Science is about experiment, theory and falsifiable ideas. For example, if the hypothesis is that we are getting closer to the sun then what evidence is for or against that? Since 1978 we see no measurable change in solar irradiance at the top of atmosphere, as measured by satellite. That’s one line of evidence that indicates no change in distance from earth to sun over 30 years. No doubt there are many others. And note that the essay contains no numbers on this specific topic and is, therefore, totally unfalsifiable. Therefore, not science. If you want to defend one part of your hypothesis then a bit at a time please. If another rambling essay appears it will be deleted. Note that the article where you have placed this comment is nothing at all to do with recent climate change, so you are already off topic, although of course, well-researched reasons that explain recent climate change will be well received. Well-researched means your experiments, experiments of others, derivations of well-established theory, or new theory supported by evidence – and NOT unsubstantiated claims. Very good work about the greenhouse effect! But how big (W/m²) is the area under the black curve (CO2)? This number would be important! This Figure 4 from the same Collins et al paper should answer your question. Some additional comments are here in thread CO2 – An Insignificant Trace Gas? Part Three. For each band we can consider a total average outgoing energy in W/m2. 1. are there any sattelite measurements that show this total average outgoing energy for each band over the last 35 years ? 2. due to the increase in CO2 over this period , the CO2 band must show a decrease of presumably a few W/m2 over that timeframe. Since the total radiation should be more or less constant (equal to the incoming solar radiation) , this decrease should be compensated by an increase in another band(s). Obviously we can take the ratio of each band to the total incoming radiation to eliminate its variation. How is this increase spread over the other 4 bands ? If we had all that data, I doubt there would be a need for this site. You don’t spend a lot of money making measurements to determine quantities of which you’re already quite sure you know the value,, at least to the capability of current satellite borne instrumentation. The best measure that we have that there is a significant radiative imbalance at the top of the atmosphere is that ocean heat content seems to be increasing at a rate that is at least in the ballpark of what’s expected from the increase in total atmospheric ghg concentraion. But even those data aren’t very good. There are no 35 year running satellite experiments with this data. 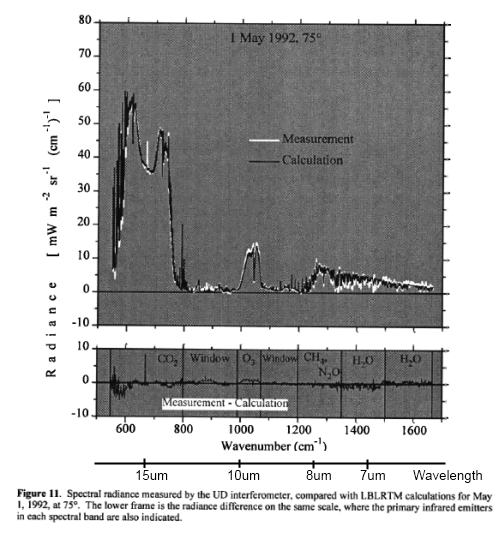 The first was ERBE which ran from late 1984 to early 1989 with a scanning radiometer – so reflected solar and OLR (outgoing longwave radiation) could be measured by location. The ERBE results were the first comprehensive look at year by year spatial plots of s/w reflection and outgoing longwave radiation. Climate science learned a huge amount from that project. 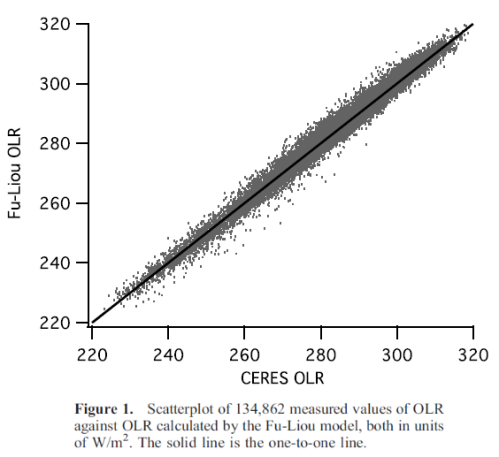 The non-scanning ERBE kept running for longer which gave total OLR (no spatial data). The long term drift was supposed to be extremely low but there were some drift questions if I remember (would have to dig). In the early 2000s, CERES and AIRS started providing much better quality of data (inspired by the successes and limitations of the ERBE project). They give data by location and by spectral channel. You have to understand that you get year by year fluctuations that are much greater than the small long term shifts that result from increasing CO2. Have a read of CERES, AIRS, Outgoing Longwave Radiation & El Nino for details on the satellite measurements and also to see the year to year fluctuations. The ERBE non-scanner data was available from 1984-1999. The scanner data has been the most useful for understanding climate because it provides OLR and Reflected SW as a function of location. The non-scanner data, by comparison, provides the total OLR via the “WFOV” = wide field of view, with no spatial breakdown. Thank you for your insights and info. I ran across a 2001 Nature paper by Harries et al claiming to have detected a change in the spectrum of TOA OLR by satellites orbiting in 1970 and 1997. I thought the subject fit this post best and so am commenting here. A close look at the paper raises lots of questions about the robustness of the data (but not, for me, about the theory of radiation transfer). Figure 1 Examples of IRIS and IMG observed and simulated spectra for a three-month average (April-June) over selected regions. a, Observed IRIS (1970) and IMG (1997) clear sky brightness temperature spectra for the central Pacific (10N-10S, 130W-180W). b, Top, observed difference spectrum taken from a; middle, simulated central Pacific difference spectrum, displaced by -5 K; bottom, observed difference spectrum for `near- global’ case (60N-60S), displaced by -10 K. c, Component of simulated spectrum due to trace-gas changes only. `Brightness temperature’ on the ordinate indicates equivalent blackbody brightness temperature. Hopefully the key figure from the paper is pasted above. The only real data is a) and the top trace in b). The rest are simulations. The most unambiguous change is in CH4, both in theory and observation. The change in CH4 is large over this period: about 1.4 to 1.7 ppm vs 325 to 364 ppm for CO2. 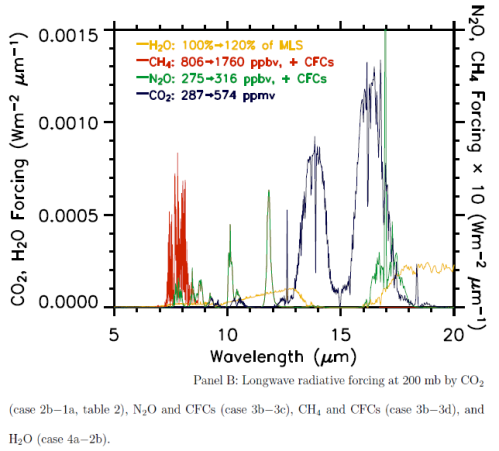 I can see a visible change in the online MODTRAN spectrum for the change in CH4, but not CO2. Perhaps that is OK, since SOD readers know that the forcing from rising CO2 comes from shoulders of the peak, not the center. Unfortunately the data doctors who wrote this paper chose to cut off most of the CO2 band, stopping at 710 cm-1 (despite the fact that both satellites collected data down to at least 600 cm-1). If you look carefully, the simulation and the real data don’t look the same on the edge of the CO2 band. Nor do the CFC-11 and CFC-12 bands. The spectral change in O3 may appear robust, but with most O3 in the stratosphere, ozone-destruction, stratospheric cooling caused by rising GHGs and falling O3, that change isn’t easy to interpret. Then I began to wonder how they simulated the expected spectra. They took reanalysis data from 1970 (the beginning of a La Nina) and 1997 (the beginning of the strongest El Nino) for the region they chose – a region most effected by ENSO. 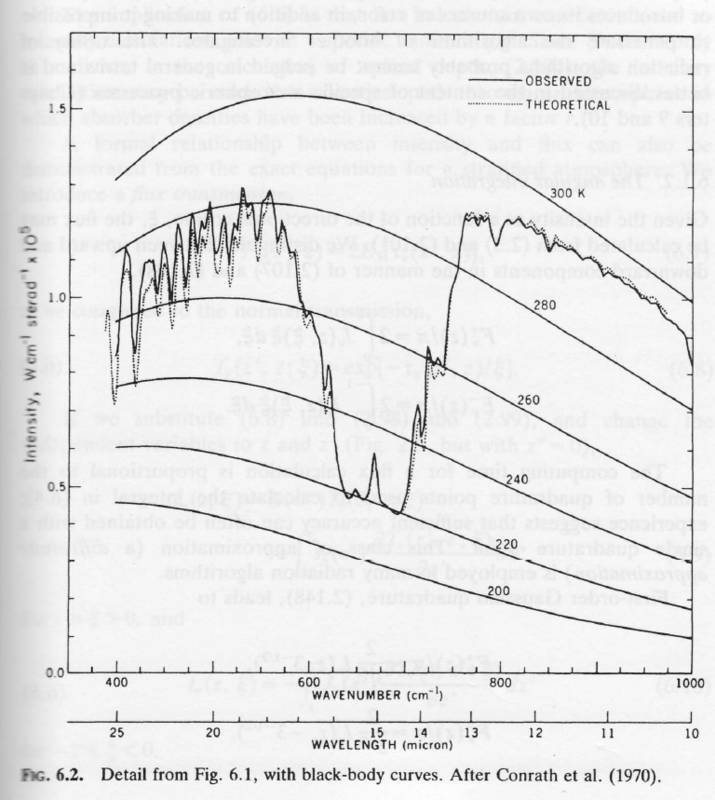 The 5 K brightness difference in CH4 brightness temperature implies that the characteristic emission level for this peak rose almost 1 km between 1970 and 1997 – assuming there was no temperature change at that altitude. There are doubts about: the reliability of radiosondes, reanalysis data back in 1970, and whether warming in the upper tropical troposphere is amplified. The characteristic emission level for CO2 is higher and near the tropopause, which is a sharp change in the tropics (and a gradual change for the rest of the world, for which data exists, but isn’t shown in this paper). Is anyone aware of a more convincing study showing that we have observed changes in radiative cooling from space?